Good news, my electricity came back yesterday evening! It was the key to having a happy birthday! You know, that and all the lovely comments from my amazing followers. Thank you to everyone who wished me a happy birthday! I had a great day! Alas my birthday is over and it is back to the other 364 days of the year that aren't quite as fun. To make this day-after-birthday cheerful, I have a happy manicure! Today's theme for the 31 Day Challenge is Floral. I had a really hard time trying to decide what sort of floral manicure to do, and eventually I settled on this cute watercolor-esque floral print! It may look familiar to you, if you are a Toms fan like me! I wish I had the shoes to pose with! Haha. 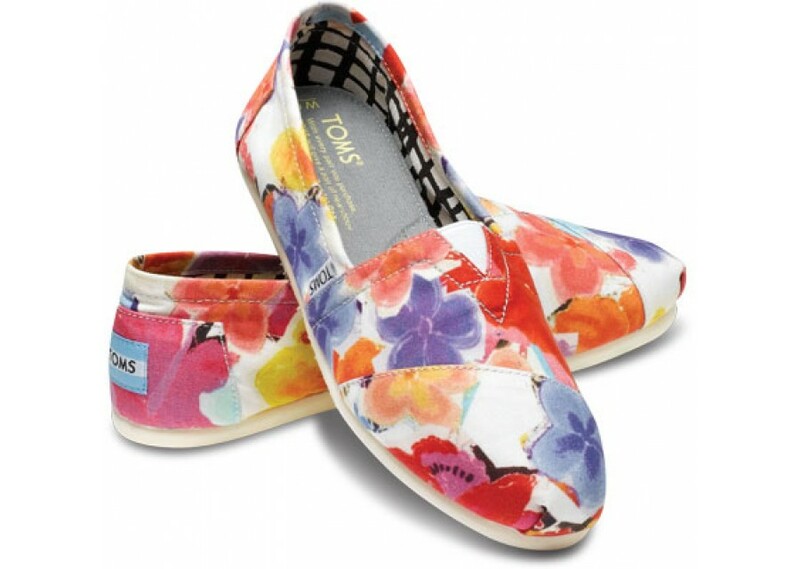 But I have 4 other pairs of Toms so I don't need these ones, despite how pretty they are. I sell Toms at the store I work in - being around them all day makes me want EVERY pair. Instead of making random blobs, I turned them into flowers! I love the blendy, watery look. What do you guys think? Do you love this as much as I do? Yay for floral and yay for Toms! I love this! You've captured the shoe's print perfectly. I have yet to try the acetone watercolor technique. I may have to try it out this weekend. This looks amazing ! Funnily enough, ivehad this exact pair of shoes n my "to do" folder on my computer, but itink I'll go ahead and scratch that idea ofte list now you've done such an amazing job at it ! Woohoo for electricity! Very happy to hear that it is back on. The colors you used for your mani today are just beautiful and I love the way you get your inspiration. I'll be anxiously waiting to see what the next challenge brings. :0) Have a wonderful night. I really enjoyed this post, I am a big fan of watercolor nails. You did a great job picking the colors.